I hope everyone had a nice Memorial Day. When I think of Memorial Day I think of family picnics, waving flags and military parades. But it also means that school is almost out! Can you believe it? I always loved this time of year when I was in school. Most of the hard stuff was over and things were winding down. Everyone was excited about their summer plans. It can be a wonderful time, but it can also be a huge time of transition, especially if you are graduating from high school. You might be wondering what’s next for you. Do you have a summer job? Are you planning to attend college in the fall? Your life is full of possibilities. And change. And change can be scary. That got me thinking about Kylie, and I have to admit, she is never far from my thoughts. After spending almost four years writing about her life, I worry about her future like I would my own child. Now, she still has a year at Shadow Falls Camp before she graduates. And we’ll all get to see her through Della’s novels. But like all juniors, Kylie’s already trying to figure out what happens next? If you read Chosen at Nightfall, I left you with what she hopes will happen. She’ll go to college, but which college? Will Lucas and Derek go to the same college? I’d like to think he will. She’s also planning for Miranda and Della to go to the same the college. Poor Kylie, she’ll have to listen to Miranda and Della fight for years to come. But she’s okay with that if she just has her buddies with her. I also hinted at what Kylie thinks she should major in? Psychology. I picked that because she’s so good at trying to help other people with their problems. But she has a whole year to decide. Do you see a different major that would work for her? What about you guys, do you know what you want to grow up and be? What are your plans? Mother’s Day has just passed, but a couple weeks ago, something happened and I was reminded of the amazing power and devotion that stems from maternal instincts. Instincts that aren’t just human, but are found in all animals. Yup, squirrels are mamas, too. I was doing what I do most of the time. Working. Lady, my junkyard dog, was resting on my office sofa, gazing out the French doors that overlook my backyard. She wasn’t just being lazy. Oh, no, she has a job to do. She is forever on squirrel duty and takes her job very seriously. Ahh, but this day she was quite tired from destroying another of her doggy toys that she’d managed to sneak outside, this one a stuffed squirrel. You see, Lady is anti-squirrel, and I think she got too much joy ripping the toy to shreds as all the yard squirrels looked on. Now, she’s a wonderful dog as long as you aren’t a squirrel. Anyway, while it was a pretty day, blue skies and puffy white clouds, the wind had kicked up. The strong gusts sent the trees dancing and the innards of the stuffed squirrel were strewn across my yard. I spotted the reason for her eagerness. There, on my concrete patio, was a broken nest of sorts. And outside the nest were four baby squirrels. My stomach clenched as I drew near, thinking the fall had killed them. But nope, they were all breathing, just too little to run away. Lady whined behind me at the doors, anxious to come out and do her squirrel duty. Since I knew squirrels weren’t like possums that could hang onto their mama’s back, and these babies were too young to climb, I imagined the worst outcome. Her babies weren’t going to make it. And from the heartfelt sounds she made, the mama squirrel knew it, too. And bam, just like that, I remembered when they took my five-week premature son into surgery. The fear, the heartache, I felt right then was as real as it was years ago. Feeling helpless, yet desperate to help, I went inside and called my hubby, wondering if I should collect the babies and take them to the wildlife vet. He didn’t answer his cell phone, so I started to go outside again, but a movement outside the window stopped me. The mama squirrel had rushed to her babies, sniffing and nudging them with her nose. What she did next completely surprised me. She opened her mouth and stuffed a baby inside. Even though it appeared impossible, she got the entire little body in there. With only the baby’s tail hanging out, she climbed back up the tree. It wasn’t an easy climb, once or twice I worried she would fall. She would stop as if to catch her breath. It appeared as if she’d either found an empty nest or had just borrowed a friend’s nest in which to leave the first baby. Then, one by one, she collected the others. With maternal strength, she saved what was most precious to her. Her babies. 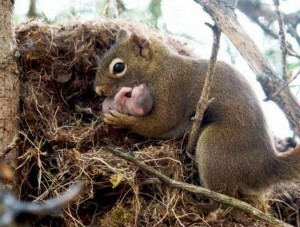 Now, I know I didn’t do very much to save those baby squirrels, their mamma had the toughest job. But I did keep Lady inside to give her time to save her babies. So, I felt pretty good about it. Have you ever saved an animal? If so, I’d like to hear about it. So, be sure to leave a comment. Last week’s lucky winner of Joy Preble’s The Sweet Dead Life is Brooke15027. Congratualtions. Brooke! Please email me at cc@cchunterbooks.com with your mailing address. If you prefer an ebook, let me know if you want it for the NOOK or Kindle and to which email address I should gift it. Today I’m welcoming Joy Preble, whose new mystery/angel series, The Sweet Dead Life is out now from Soho Press! In The Sweet Dead Life, the angel book gets a Texas makeover from the author of the Dreaming Anastasia series. So begins the diary of Jenna Samuels, who is having a very bad year. Her mother spends all day in bed. Dad vanished when she was nine. Her older brother, Casey, tries to hold together what’s left of the family by working two after-school jobs—difficult, as he’s stoned all the time. To make matters worse, Jenna is sick. Really sick. When she collapses one day, Casey tries to race her to the hospital in their beat-up Prius and crashes instead. Jenna wakes up in the ER to find Casey beside her, looking pretty good. Better than ever, in fact. Downright…angelic. The flab and zits? Gone. Before long, Jenna figures out that her brother didn’t survive the accident at all, and she isn’t just sick; she’s being poisoned. Casey has been sent back to help Jenna find out who’s got it out for her, a mystery that leads to more questions about their mother’s depression and their father’s disappearance. CC: Where did the inspiration for writing The Sweet Dead Life come from? CC: The Sweet Dead Life is set in Texas. Tell us about that. CC: TSDL is Casey’s story to a large degree, since he’s the one who comes back as an angel. So could you talk about choosing his younger sister Jenna as the narrator? Joy: Again, the narrative choice was originally my editor’s. But I did agree. I love the juxtaposition of Jenna’s innocence—albeit with a feisty, sarcastic voice—with Casey’s less than reputable habits and subsequent angel journey. Having Jenna narrate heightens the reader’s sense of what is happening to this family and as the series continues with next year’s The A Word, also allows you to see the larger battle of good and evil through a fresh set of eyes as well. CC: Speaking of Casey, this is a very different kind of angel book. In what ways do you see it putting a different twist on the genre? Joy: Well, from the beginning, we knew this book would be different and after that, we embraced its differences. Basically, Casey begins the story as more too-many-late night-taco-run flabby middle than tatted up/fallen angel hottie. While obviously paranormal, the novel grounds itself in the real life suburbs. And what seems to please a lot of early reviewers is that it is a mystery/comedy not a romance. Which is not to say that there is no romance in the book—there is (and in fact Jenna’s first romance ever plays a large role in the upcoming The A Word next year). But the sibling story and the family mystery play a much more central role. All of which readers seem to be loving. Yay! Joy: Well, right now I’m finishing revisions and edits on The A Word. The first 50 pages will be appearing in the Soho Spring 2014 sampler that will make the rounds of the trade shows this summer. I am really excited about continuing Jenna and Casey’s story! And there are other projects in the works that I hope to be able to tell you about soon! Want to find out more about Joy’s books? 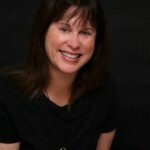 Head over to joypreble.com or follow her on Twitter at @joypreble. 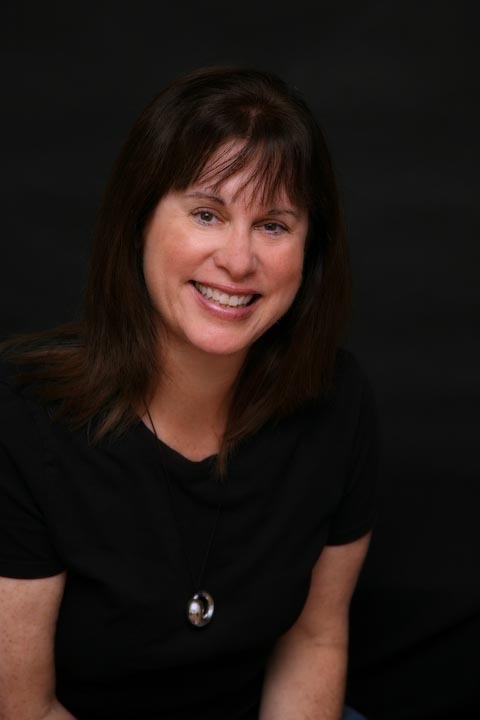 Joy Preble is the author of the popular and highly acclaimed Dreaming Anastasia series. A former English teacher, Joy grew up in Chicago and is a graduate of Northwestern University. She is now a full time writer and lives with her family in Texas, where she has learned to say “y’all” without any hint of irony. A tireless advocate for literacy and great books, she is at the center of the all-important Texas YA scene. This week I’m giving away one copy of Joy’s book The Sweet Dead Life to one lucky reader who leaves a comment. Remember, if you are reading this on Goodreads, you need to leave your comment on my website blog in order to win. Also, I have to limit this giveaway to U.S. residents. The International winners of Chosen at Nightfall are Stine Spo (Denmark), Jessadelle Ng (Singapore), Lena (Germany), Sarah Kalaitzidis (Canada) and Stephany Regina (Brazil). Please email your mailing address to cc@cchunterbooks.com. The U.S. winners of Shadow Falls t-shirts are Nicole Stevens, Maragret K. and Kayla. Please email your mailing address and t-shirt size to cc@cchunterbooks.com. I have a special blog for you today and some exciting news. But first, do you guys know what next Sunday is? Mother’s Day. If you guys have read the entire Shadow Falls Series you have experienced the ups and downs in the relationship of Kylie and her mom. Do you remember how in the beginning she called her mom “The Ice Queen?” Through the course of the novels, Kylie discovered some things about her mom that I think we can all learn from. She realized her mom wasn’t all bad. No, she wasn’t perfect. She’d made a lot of mistakes throughout her life, but after discovering a few things about her mom’s past, Kylie understood why her mom is the way she is. Kylie accepted that everyone makes mistakes, and that everyone has flaws—even parents. She also learned that when you love someone, you accept them and love them in spite of their imperfections. So I hope on Sunday, you’ll take a minute like I know Kylie would, to tell your mom you love her. Yes, the relationship between mothers and daughters can be trying at times. Sometimes moms will want to make sure their daughters don’t make the same mistakes they did, so they try too hard to push them to be something they aren’t. Sometimes, we try too hard to be what our moms want us to be. Sometimes we rebel just because we don’t want someone trying live our lives for us. But the thing we need to remember is that most of these difficulties stem from love. So be patient, see past the issues to the love that exists in almost all mother/daughter relationships. Now for all my exciting news. First, thanks to all you readers, the Shadow Falls series hit number three on the New York Times best-seller list. It also hit number twenty-five on the USA Today list. And I’m serious, this happened because of you. So thank you! Another bit of good news? The audio book for Chosen at Nightfall is now available. 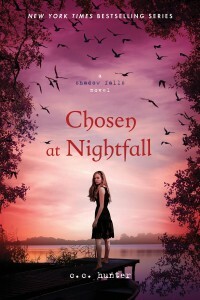 Chosen at Nightfall was released on April 23, so many of you already have it. However, some people prefer audio books over prints. I can see how an audio book is great to listen to if you are walking, working out, going for a long car ride, etc. So for you audio book people out there, you can now listen to Chosen at Nightfall no matter what you are doing. It is available at Audible and at iTunes. Now, for my third announcement, I have a lot of giveaways on my blog, and I usually limit them to residents of the U.S. I know I have a lot of very loyal readers who live in many different countries, and I haven’t forgotten you! This week, I’m having a giveaway for my fans who don’t live in the U.S. I’m giving away five copies of Chosen at Nightfall, with a Shadow Falls T-shirts to my international fans. Here’s what you have to do. Since Mother’s Day is right around the corner in the U.S., tell me something special about your mom, and tell me what country you are from. Next Tuesday I will post five winners from outside the U.S. I will also be giving away three t-shirts to my U.S. fans, so you guys need to post comments, too. Thanks again guys for helping me reach my dream, and Happy Mother’s Day, to you and all your moms. Meet Me at the Book Festival! Do you live in or around Round Rock, Texas? Are you coming to Yabfest on May 11th. I’m hosting a special contest for those planning on coming. Email me at cc(at)cchunterbooks.com, send me your name and your shirt size and tell me that you are coming and I’ll enter your name into a drawing for a free Shadow Falls t-shirt. Three people will win t-shirts. I’ll draw the winning names, email you and let you know you won, and then I’ll bring the t-shirts to the festival for you to pick up. Young Adult Book Festival (Yabfest) is a really cool event. There will be many YA authors there. To see a list or enter a book giveaway (you could win Born at Midnight, among others! ), go to Sharon Bayliss’ blog. And the winner of the middle name contest is Claire luvs horses. Della Rose Tsang. Claire, you won a $25 gift card to either B&N, Amazon, or Katy Budget Books. Email me with your card choice and address at cc(at)cchunterbooks(dot) com. 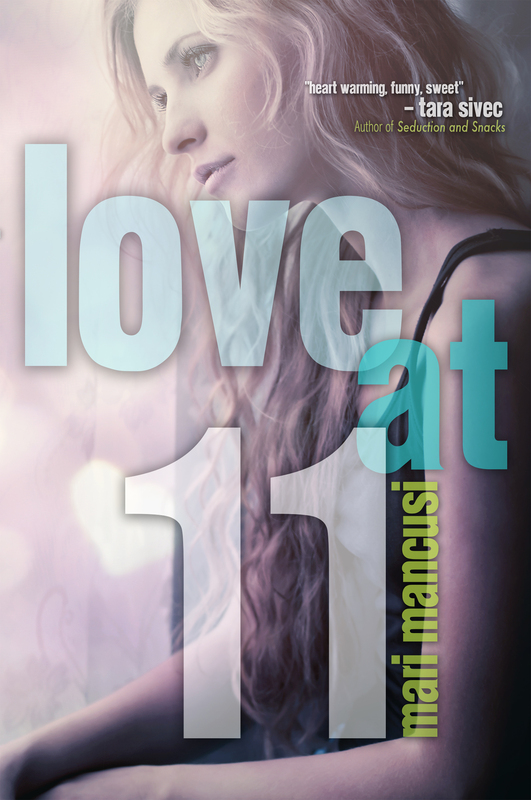 The winners of Mari Mancusi’s book Love at 11 are Makenzie Bice and Ceci. Please email me with your address and whether you want an ebook or hard copy to cc(at)cchunterbooks(dot)com.